Can I just say? This whole magnet making thing is totally gonna end me. There's too many things to "magnet-ize." My friend made this one for me - you know, my only friend who watches this show? The one who doesn't have cable, so I totally enable him by dropping the show to DVD for him every week? I picked Bobby Elvis today, because yesterday, I was riding around in a golf cart with a strongest man in the world contender, and he asked me what my favorite show is. 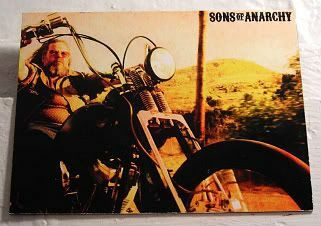 Do you know how funny it is explaining my Sons of Anarchy love with a straight face and a pipsqueaky voice to a gentle giant who's never heard of the show before, all while holding on as the golf cart's rounding the curves of Innisbrook's main drag? Like, here, now, I can explain the Kurt Sutter show as a well-written, -directed, -produced, -acted cablenet drama about a motorcycle club, with cute boys and their hot cuts, who run guns and an adult entertainment company, try to keep the peace between the other clubs and fight off Ally Walker as the lawwoman and Adam Arkin as the Eastern European baddie. Much harder when you say it out loud. Especially because as I've mentioned before that once again, I'm skewing the Nielsen demos with my love for this show. I'm a girl. I'm Asian. I'm the wrong age. Oh, and I'm not a biker chick. And, if you knew me, you'd realize how far away I am from being a biker chick. I bet I could be a biker chick if I wanted. A higher-register-speaking, Doris-Dayish-haircut-wearing, cute-cupcake-eating, cute-pen-toting, cute-paper/notebook-holding, cute-color-coordinated electronics-using biker chick. But I'd rock that little sidecar like no one's business, man. Now, I just need a nickname. Oddly, I was dubbed Sidecar earlier this year because of my Erik Estrada ridealongs, and Cupcake last night because of my "secure the birthday cupcakes" mission for one of our golfers yesterday.